Custom store fixtures for retailers are important for maintaining the over look and theme of a department or store brand. Tusco Display has been proud to partner with not only the brand itself but departments and categories of major retailers. From big box to specialty retailer each program from concept to delivery is engineered to meet specifications and time lines to insure each retailer is able to meet the demands of programs and maximize consumer awareness.All of the details of retail brand custom point of purchase displays are handled under one roof. Conceptual drawings, engineering, prototyping, production, packaging, and shipping all coordinated and executed from out facility. The ability to maintain the projects in house means our clients don't "pay for the water" of using an offshore resource. Located equidistant from Pittsburgh, Cleveland, and Columbus Tusco Display is situated from several major interstate highways and able to coordinate entire shipping programs as well as LTL delivery.It is all about the three and a half seconds to capture your customers attention, it’s the critical retail path to purchase. And the growth of high-quality data about shopper decision making lets us apply science to what had often been purely aesthetic decisions. It fosters ingenuity insights and creative solutions that cut through the clutter to get your products noticed and sold. 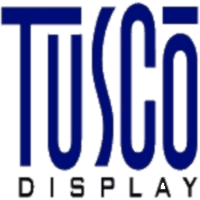 You can rely on Tusco Display to help execute and deliver your program.